Blue belt DIYer. Moderately proficient and occasionally useful. See my finished master bath here. Amateur Jill of all trades? Hardly! More like a fine multi master of all trades. But yeah, totally amateur. I'm WAY too slow for anyone to pay me for my tile work. After some of the usual life delays and a whole lot of "I don't want to live in chaos right now", we're finally getting going on the project. We currently have the original 1980s cabinets and counters, along with a 1990s ceramic tile floor that has survived remarkably well considering I did it before I came here. Here is a rendering of the new plan. We're having cabinets made (and do I ever hate getting quotes from people), but doing most of the rest of the work. Tile will be floor in kitchen, half bath and closets plus backsplash. We started out looking for something for the floor in a mid-grey with some texture in 12x12, only to discover that all the cool designs are now just available in 12x24. Bowing to the inevitable, we picked Olympia Shadestone porcelain in "anthracite", which will go over ditra. The kitchen is good on deflecto, but the bath is on the other side of the center load wall of the house, so the joists are longer. Assuming I am able to fix the deflection problem, do I still need to put in a movement break at the bathroom door? Are people still using versabond over schluter? (I know, not unmodified). I also have access to the full Laticrete line. Is an 8 lb tile considered "heavy" or just normal? 1. I would, Wendy. It's a very easy and convenient place to do so. 2. Some are. 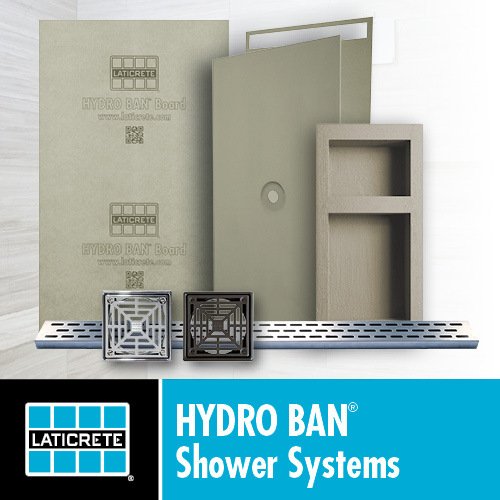 But some of those have also switched to the USG Shower System membrane because it's thinner and easier to use and technically a better product. 3. That would likely fit into the industry standard category of Large and Heavy tile (LHT). 2. This would be over ditra to place floor tile. No waterproofing needed this time. Is there a mortar you'd recommend? Since you have access to Laticrete, take a look at Stratamat. Nice! It seems to solve all of ditra's issues. Including the horrifying color. I remeasured the joists and ran everything through the deflecto, and I don't have to build an extra wall in the basement after all. The other side of the house gets a L/458. Even if the wood were lower quality, it would be a borderline L/350. I'll still be putting in a movement joint. I'm looking for ideas for the kitchen window. When we put in new windows, we did them all the same with mitered molding top and sides, and then a small stool with straight cut molding to support it. Mostly we used 3 1/4", but the cabinets forced 2 1/4" up the sides. Over the years we've had some water damage to the wood because it's right over the sink. In the new version, there will be glass mosaic tile between the new quartz counter and the cabinets. A) Sand and refinish or recreate from new wood the current molding, with a few extra coats of poly and the knowledge I'll have to refinish from time to time. B) Replace the bottom molding with the same 2 1/4" that is around the other sides making a picture frame (lower profile, so hopefully less water, and easier to tile up to). C) Use some magical unknown substance that would let me eliminate the molding and tile around the window without everything cracking the first time the temperature changes or the window is opened. A. You could do that. B. You could remove the apron entirely and simply tile below the stool when you do the rest of the splash. C. While not the easiest task, I think you could tile over the edge of the window jams, leaving the same reveal you have with the current casing, but not attaching the tile to the jamb. I would prefer the current look, but I don't live there. I might be inclined to do drywall returns on jambs, return mosaic on jamb lining up with backsplash top, maybe whole jamb, and make sill from same quartz going on countertop. Could also line jamb with quartz, but may be too thick even at 2 cm. Do you have a picture of that, Peter? I'm having trouble visualizing. Right now there are @1/2" jamb extensions to get the jambs even with the drywall. We're pulling out most of the wall to do wiring changes, and I was planning to put in hardibacker behind the tile. I also need to do a mock-up of CXs suggestion B. That would avoid most of the water and also give more area to the pretty tile without any major changes. You'd remove all the jambs & extensions and replace with drywall which wraps into window. I assume cabinets will be out which would be the time to do it. Let me see if I can find pics of one I've done. You know you've lived in a house for awhile when you're ripping up tile you installed. It was ceramic, over cement board, and done before I discovered this forum, but it held up pretty well for about 20 years. Tile and board are coming up together with some hammer drill persuasion, but there's a residue of thinset on the plywood underlayment. Plans are to lay Stratamat followed by 12x24" porcelain. We're at a decision point. Do we clean or replace the plywood underlayment? How clean does it need to be and what it the best way to get it that way? I'm inclined to pull it all because it appears to be 5/8" (laid correctly and over OSB subfloor), there is some old water damage under the dishwasher, and grinding up old mortar seems like a huge chore involving vast amounts of dust. OTOH, new 3/4" T&G would be about $300 and also involve a bunch of effort. Tell me what I should do. I might even take your advice.